Welcome to my blog, thanks for taking the time to visit! It’s been a frenetic but FANTASTIC first year in business, and I must admit I could not be happier. I’m grateful for the support from family, friends & clients (and friends who became clients!). That said, between attending design school, the kids, work, and channeling my creative energies to my clients projects, my own home has been a wee bit neglected. 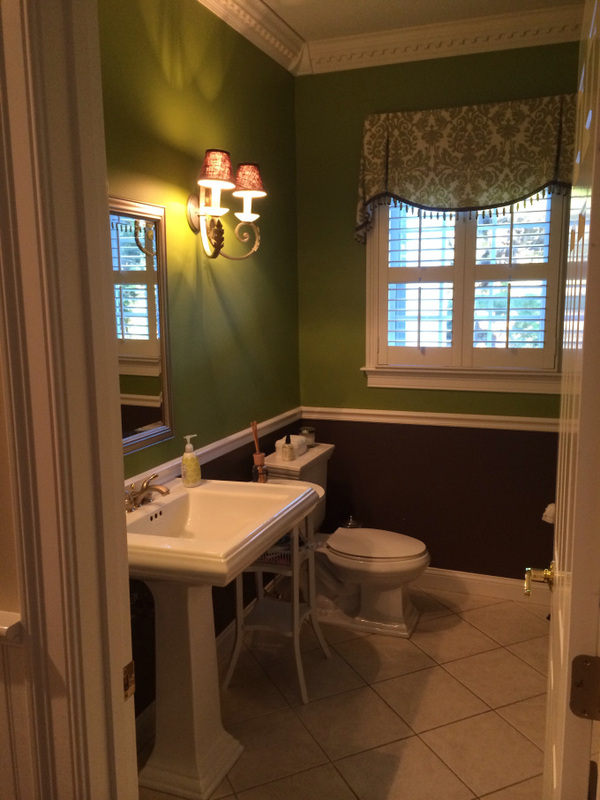 Time for a little facelift for one of my favorite rooms to re-decorate – the powder room! Little bathrooms provide opportunities for big design statements, and because of their scale, a small change or two can completely transform the space. 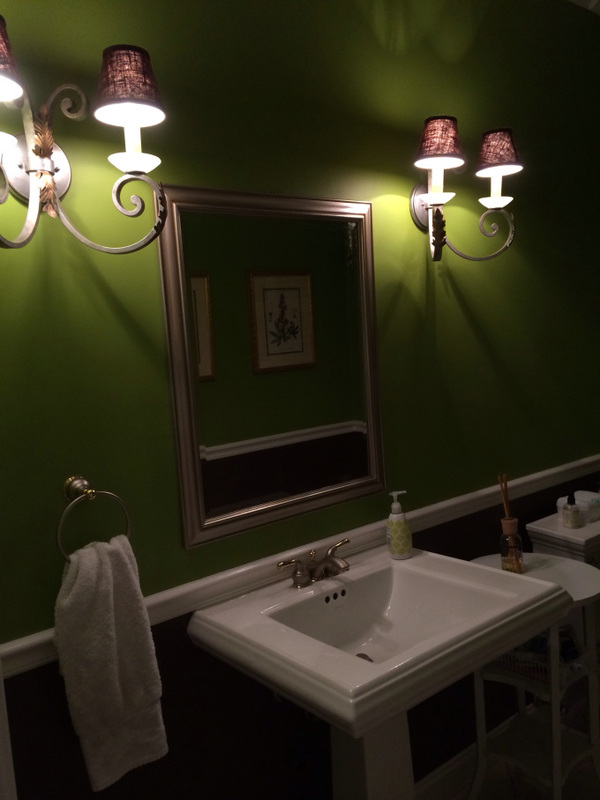 First, a bit of history – I never liked the tile, mirror, faucet or light fixtures – so pretty much everything – but we just purchased the house and it was brand new, so changing hard surfaces was a tough sell! So, I painted the walls an interesting combination (myself!) and added a detailed soft window treatment as a focal point to distract from what I didn’t like. After a few years, I realized we needed better privacy in this first floor room that looks directly into the backyard, so I added plantation shutters. I loved the look and function, but the natural light in the room decreased, and so the dark color scheme did not work anymore. Now, years later, it’s time – and I’m re-vamping just about everything! My goals – a better lit room that is sophisticated & classic yet uses updated materials – and an overall cleaner look that’s just more, well, me! My color scheme? Well, let’s just say it will tie in nicely with the existing first floor colors nicely. Work starts Monday, stay tuned for progress updates!